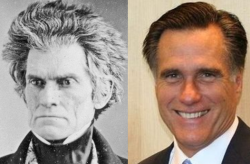 John C. Calhoun & Mitt Romney: Twins? You know you are losing an election when you and your party are compared to the ‘planter elite’ that reigned, in the US, in the mid 1800’s. An essay by Mike Lux is a stinging indictment of what passes for Republican party politics today and he compares it to the politics of John C. Calhoun and the later ‘Robber Barons’ of the 1880’s. Ouch. One really doesn’t bring back the dead like John C. Calhoun unless it’s serious and I believe that this time in history is serious for the choice we all need to make on Tuesday. This entry was posted in History, Politics and tagged 1850's, 2012 US Presidential Election, andrew carnegie, John C. Calhoun, Mitt Romney, Republicans, robber barons, state's rights on November 4, 2012 by Doug.